East Lansing, M.I. (May 29, 2012) – “Welcome to Moe’s!” will soon be heard throughout East Lansing when Moe’s Southwest Grill opens at 551 East Grand River Avenue on Thursday, May 31. A Gold Award winner of the 2008 Consumer’s Choice in Chains Awards, Atlanta based Moe’s Southwest Grill’s serves fresh made-to-order burritos and southwest fare in a fun and laid back environment. When you walk by East Lansing’s newest burrito joint the first thing you’ll hear is a familiar “Welcome to Moe’s!” It’s more than a greeting; it’s a way of life for the folks who customize each meal fresh to order right in front of the guest. Guests can also try the first all-new Coca–Cola Freestyle® soda fountain in Lansing. The sleek, stylish new fountains are touch screen operated, enabling consumers to select from more than 100 regular and low-calorie beverage brands –including more than 70 diet, low-calorie and 90 caffeine-free beverages, 80+ unique brands offered nowhere else, as well as many varieties of waters, sports drinks, lemonades and sparkling beverages that, prior to the arrival of Coca-Cola Freestyle, were not available in the U.S.
East Lansing’s Moe’s will offer Moe Monday’s where guests can purchase any burrito, drink and chips for only $5.00. Tuesdays are Kid’s Eat Free after 4 p.m. with the purchase of an adult entrée. They will also accept Spartan Cash for Michigan State University students. They will be open Sunday through Saturday from 11 a.m. until 10 p.m. For more information or for catering opportunities guests may call 517-580-3441. WHAT: “Welcome to Moe’s!” will soon be heard throughout Bethlehem when Moe’s Southwest Grill opens at 3211 Schoenersville Road on Friday, May 18th. A Gold Award winner of the 2008 Consumer’s Choice in Chains Awards, Atlanta based Moe’s Southwest Grill’s serves fresh made-to-order burritos and southwest fare in a fun and laid back environment. To give an official welcome as only Moe’s can, the first 10 customers will receive a gift card for Free Burritos for a Year (52 Burritos). Guests also have the opportunity to enjoy a free side of Queso all day May 18th as a part of the grand opening celebration. WHEN: Friday, May 18, 2012 from 11:00 a.m. – 9:00 p.m.
BOSTON, Mass. 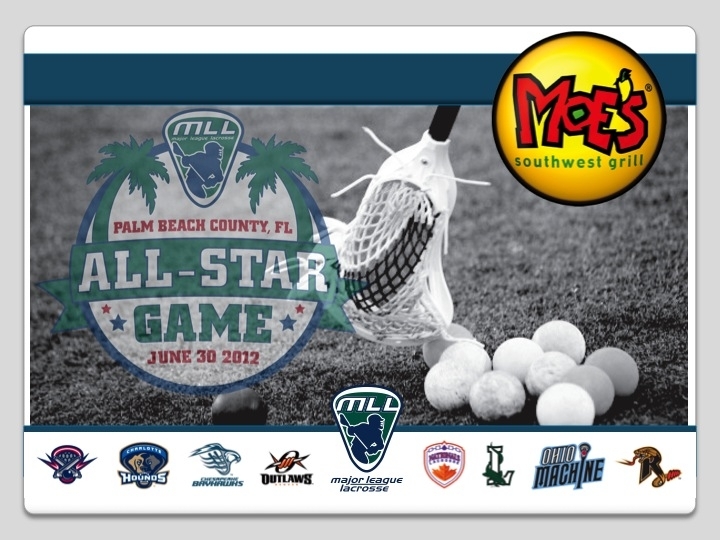 (Tuesday, May 8, 2012) – Major League Lacrosse (MLL), the premier professional outdoor lacrosse league, announced Tuesday that Moe’s Southwest Grill will be the official presenting sponsor of the 2012 MLL All-Star Game to be held on June 30 at FAU Stadium in Palm Beach County, FL. The event will take place at 7:30 p.m. ET and will be aired live on ESPN2. The partnership will provide Moe’s with corporate visibility including their logo being prominently displayed on team uniforms, field signage board, video board commercials and in-stadium banners. Moe’s will participate in the MLL Fan Zone and local Moe’s franchises will run in-store contests leading up to the event. The MLL All-Star Game boats the top lacrosse talent in the world and has become the league’s marquee event since its inception in 2001. It has been hosted in Connecticut, Maryland, New York, Colorado and Massachusetts. This year will mark the first ever event to be held in the state of Florida in addition to the first non-university sporting event to be held at FAU Stadium. For more information about the 2012 MLL All-Star Game, please visit www.majorleaguelacrosse.com/all-star-game/.